hope that "holds" another few days!! Captain Mustafa Onay, Chef Ghislaine Bruyere-Onay and Steward Necmettin Bagi, the well known professional and competent crew of Zarik I, priding themselves on the unconditional success of their service, are now operating Zarik II. They are efficient, unobtrusive and sensitive to the needs of the guests on board and their great ability to work as a team makes them very special. Mustafa Onay has long experience at sea. Captain on a gulet of the Yesil Marmaris fleet he then joined Ghislaine Bruyere-Onay on board the lovely French classic ZARIK. Ghislaine sailed her boat from France in '82, enjoyed the area so much that she stayed and she and Mustafa chartered very successfully on the Turkish coast and among the Greek Islands. 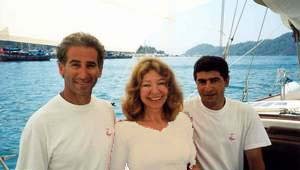 In 1994 Mustafa became Technical Manager of the Stardust Marine base in Marmaris while Ghislaine continued chartering and captained Zarik until 2003, assisted by Necmettin acting as deckhand/steward. 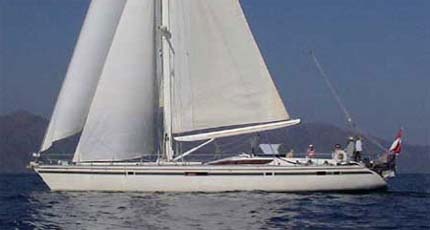 In 2004, Mustafa and Ghislaine bought Zarik II and 2005 was their first season with the new boat, the three crew members being finally reunited to form the very professional, always gracious, friendly and unobtrusive crew of Zarik II, their most outstanding quality being their unfailing flexibility and their desire to please their guests. Languages fluently spoken on board : English, French, Italian, Turkish.